While the original KEYOne is built by TCL, the Limited Edition Black that retails in India is built and distributed by Optiemus, also featuring more memory and storage (4 GB and 64 GB vs. 3 GB and 32 GB on the TCL version). The BlackBerry KEYOne flagship has been around for a while, but now it gets a new color, improved specs, and even a new manufacturer. However, it seems this new version is not going anywhere outside India for the time being. Dubbed BlackBerry KEYOne Limited Edition Black, this new handset has been unveiled during a special event that took place in New Delhi and is expected to go on sale exclusively via Amazon India later this month. 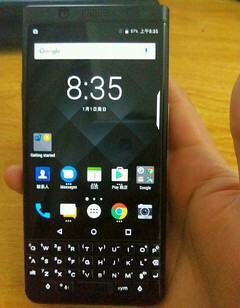 The specs and features of the BlackBerry KEYOne Limited Edition Black are identical to those of the original model, except the amount of memory and storage. While the original KEYOne has 3 GB RAM and 32 GB internal storage, the Limited Edition Black offers 4 GB RAM and 64 GB internal storage. The Indian customers interested to get this new BlackBerry handset with a physical keyboard will be able to do so starting on August 8. The price has been set at INR 39,990 - roughly US$628. Special offers for American Express Card Members and those who sign up with Vodafone can get up to 75 GB additional data traffic for 3 months.